I am a strong believer of dressing according to your body type, but I vehemently oppose any rules that restrict women of any size from dressing the way she wants to. For those who do not know, there is a huge difference between body type and body size. Body type is your body's basic structure, often described as apple, pear or hourglass. Body size is the current shape of your body, like small, medium or large. Body size can fluctuate but body type rarely changes. 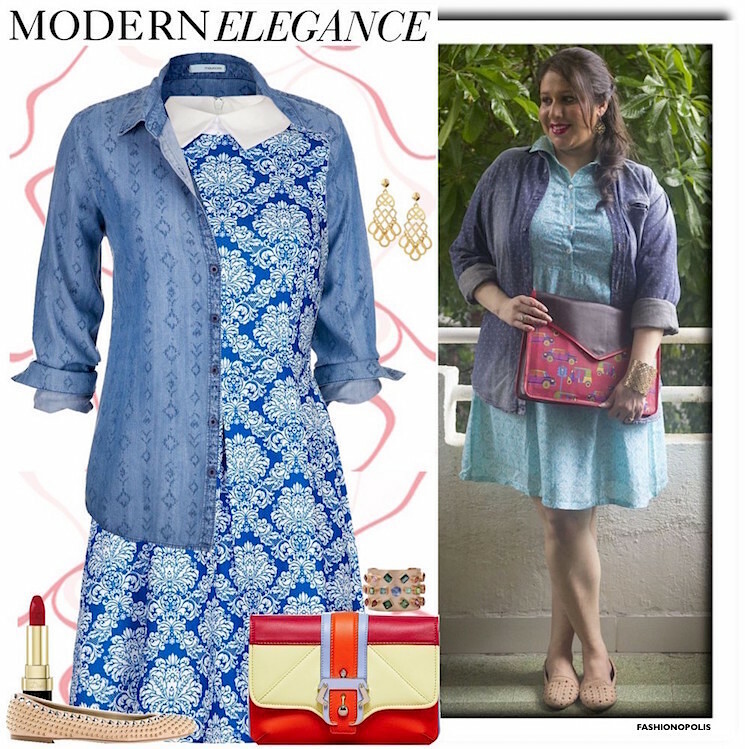 When I was younger, I was petrified of fashion trends, because I was what Indian society fondly calls a ‘chubby girl’. Ironically, this was around the same time I was applying to fashion schools. To make matters worse, every magazine and fashion related option piece categorically chose to ignore women of my stature and all they could offer me was a list of fashion no-nos! Back then you were either thin or fat and the concept of plus size had still not arrived in India. You can’t wear this, you can’t flaunt your that and so on, till I had convinced myself that the only outfit well suited for me was baggy t-shirts and black track pants or loose jeans. Honestly, for the longest time I have been guilty of letting these so called ‘fat girl fashion rules’ control what I wear and how I wear it. However, over the course of time I have managed to figure my body out, learnt to accept it the way it is and work with my assets. The one thing I have learnt during my journey is, all these plus size fashion rules and no-nos are just another way to make plus size women feel uncomfortable about their bodies since they don’t fit into the standard norm of beauty. 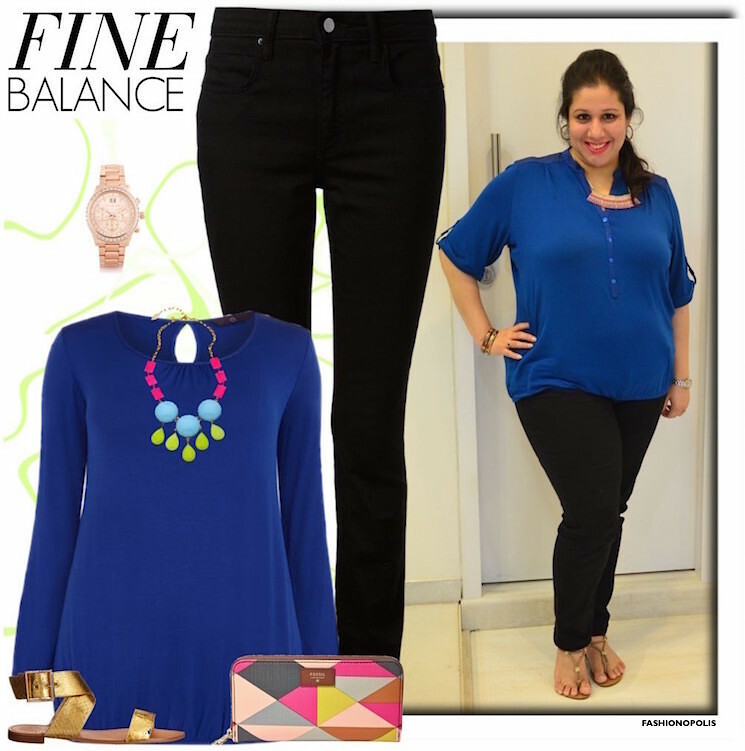 Ladies, it is time to break these plus size fashion rules, ditch our inhibitions and embrace fashion in all its glory! Once you start experimenting with fashion, there is a whole new world of possibilities out there for you. And instead of fearing fashion you are bound to fall in love with it. Old Rule: Black is your only friend! New Rule: For the longest time I covered myself up in all things black hoping it would make me look a little less round. Big mistake! While black is known for its “slimming” qualities (not always though), it is just too absurd to make it the sole colour of your wardrobe! 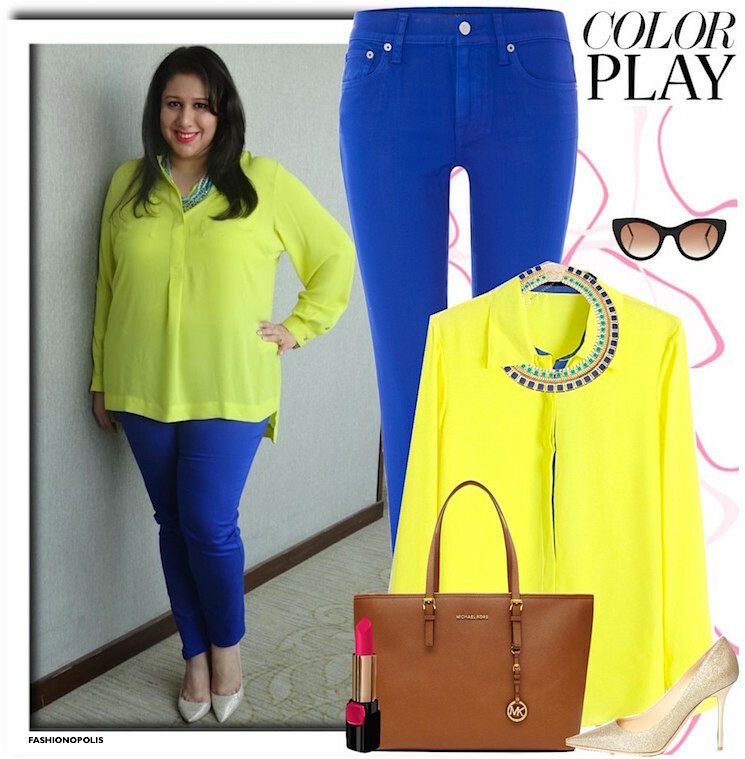 The real trick to wearing bright colours is to select a fit and silhouette that complements your body type. Once you have figured out what works for you, you too can totally rock a bright and bold colour block look like your favourite fashionista. Old Rule: Layering is not for the likes of you. New Rule: This rule is usually accompanied by, “more clothes will add more bulk”. Since I believed this to be true, I made it my life’s mission to avoid wearing more clothes than need be and deprived myself the joy of layering. When I finally found the guts to give layering a try (happened in 2015 for the first time) I finally realised what a foolish rule this is. For starters, layering does not add bulk, it is the fabric of the garment that does. So anyone who layers two thick fabrics together is going to look bigger than their normal size. The key to acing a layered look is by selecting the right fabric and silhouette for the look. Once you figure this out, there are limitless styles in which you can layer your look. If layered with correct fabrics and silhouettes, the final look can be aesthetically appealing and figure flattering. Old Rule: Mixing prints and patterns is so not your thing! New Rule: There was a time where plus size women were discouraged from wearing too much print and suggested to opt for the smallest pattern possible. God forbid the print should draw attention to our “flaws and imperfections”. 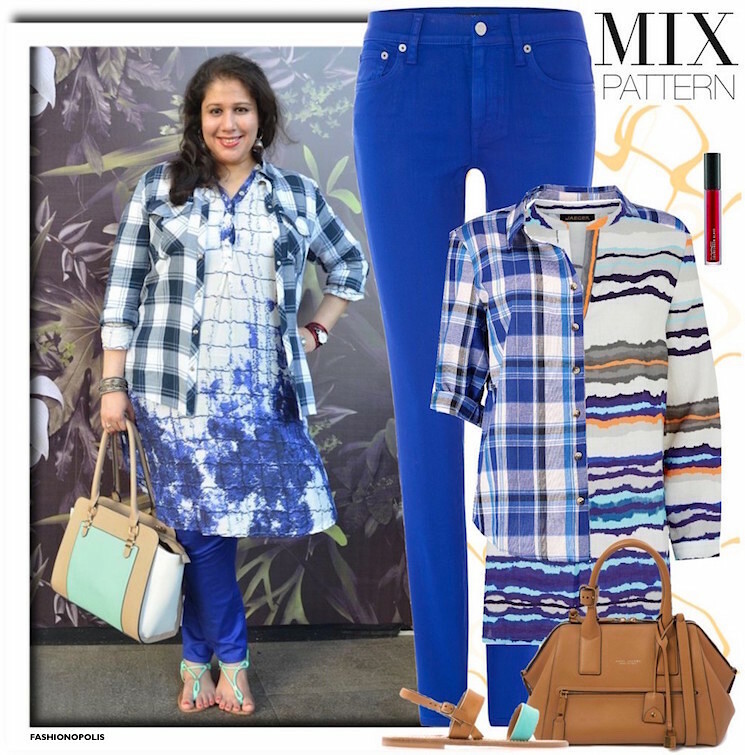 While many plus size women prefer to keep a safe distance from bold and dramatic prints, most of then completely avoid pattern mixing of any kind. Honestly, print mix is not an easy trend to pull off. But by no means is it impossible. The trick is to find balancing prints. Prints that complement each other in shape, design or colour as well as are flattering to your body type. Just in the case of colour blocking, it all comes down to the fit and silhouette of the garments. Once you got all these factors aligned, you’re all set to flaunt an eye catching print mix look just like your fave street style goddess. Old Rule: Go Loose or Go Home! New Rule: Since I can remember curvy, full-figured, plus size and fat women have been made to believe that fitted clothes are their biggest nemesis and will draw unwanted attention to every bump and lump they so desperately want to hide. The best way to take all that attention away is by covering yourself up in loose, oversized and ill-fitted clothes. This is one of those unspoken rule that has been passed down from generation to generation without really being questioned. But here’s the biggest paradox- Trying to cover your curves and fuller figure with loose and shapeless silhouettes will not only make you look bigger than your normal size, it will also hide all your assets. Instead of trying to cover up, opt for something that fits you well and shows off your curves without clinging to them uncomfortably. This way you end up looking the exact size that you are and not a shapeless entity! Honestly, there is no shame in having a fuller figure or being plus size and wanting to flaunt those curves. Most of the times, I prefer to play it by the rules, but when it comes to fashion I suggest go and break as many rules as possible! I don't think it's fair for women of a certain size to feel fashion is not for them. I have always believed fashion is for women of all shapes and size. You just have to find your own style and be comfortable in it.